As a metropolis with temperatures as hot as 45 degrees Celsius during the summer, Dubai isn’t an ideal pedestrian city. The five lane highways and 100km/hr speed limit make it dangerous to bike around and almost impossible to navigate on foot. But don’t worry, the city has plenty of transport alternatives to help tourists get around with no hassle at all. Taxis are probably the most efficient way of getting around Dubai. The city has no shortage of cabs that can be hailed off the streets, called over the phone or even booked via an app called RTA Smart Taxi. The fantastic thing about taxi rides in Dubai is that they aren’t expensive at all! Rates depend on the distance, time of day and traffic, of course, but generally the prices are fairly low. A taxi ride from the airport to Downtown Dubai will cost approximately US$20. DXB Airport has no shortage of taxis available at the arrivals exit. Booking a ride through a phone app has become increasingly popular around the world, including Dubai. Careem is a regional app for calling a car, and follows the same procedure as Uber, where passengers can get a car to their location with the click of a button. Although Careem is slightly more expensive than hailing a taxi, it provides nicer cars and sometimes amenities like water and phone chargers. A Careem ride from the airport to Downtown Dubai will cost approximately US$25. This is definitely the cheapest way of getting around Dubai. The Dubai Metro is unlike many around the world as most of its rails are above ground, providing passengers with scenic views of Dubai’s famous Sheikh Zayed Road, where most of the city’s well-known buildings are located. The Dubai Metro has only two routes that travel mostly in a straight line through town, so you may still need to grab a taxi or Careem from your nearest metro station. A metro trip from the airport to Downtown Dubai will cost approximately US$5. Although regular buses aren’t the best way to get around Dubai — rides sometimes take five times longer than getting a cab — the Big Bus Tour is a good option. This is undoubtedly the most touristy way to get around town, but it is a great option for those who wish to see the city from a double-decker bus and visit sightseeing spots. The Big Bus Tour goes past the popular Madinat Jumeirah and the Gold Souk. The bus works on a hop-off/hop-on basis, where you get off at the spots you wish to visit and simply get on the next Big Bus that comes around. The Classic Ticket for the Big Bus Tour costs US$62.50 when pre-purchased. This is not the most common way of getting around Dubai, but it’s undoubtedly the most unique. 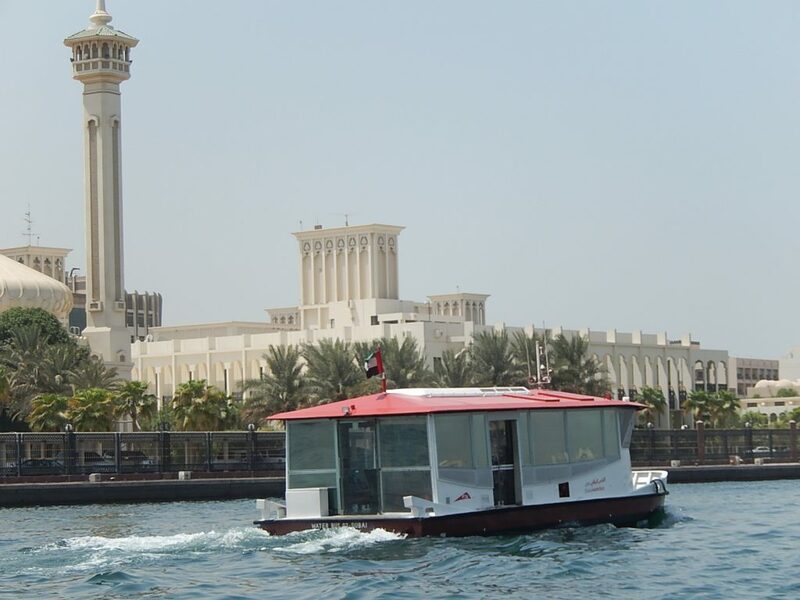 Water Taxis allow visitors to experience a scenic boat ride through the Dubai Creek while still using the city’s public transport. People can actually commute from one area of town to another through the waters. You can get great pictures of the city while still efficiently getting from one spot to another. This floating experience unfortunately doesn’t come cheap, and neither is it very fast, but it’s certainly still worth it. A ride from Dubai Marina to the Deira Old Souks will cost approximately US$85 and take around an hour and a half.